Judging by the amount of hits my post last year on Rudolph the Reindeer has been getting lately, http://pixiedusthealing.blogspot.ca/2011/12/reindeer-bullies-bach-flowers-for.html it seems as though a lot of people are thinking about reindeer. I guess it is the season. Or at least getting close. When a lot of people become focused on the same thing I think "the thing" is worth examining a bit. So I decided it would be a good day to look at the spirit of Reindeer as an animal sign that might be providing us humans with some welcome direction. It would seem some flexibility is required here. Reindeer wasn't exactly listed in my Animal Spirit Guide books. But Caribou are. And if I saw anything like the critter in today's picture, at this time of year, I would call her a Reindeer. I hope that wouldn't be insulting to the Caribou- I mean it as a term of endearment and respect of the season. And I think they probably share pretty similar Spirit. As is often the case, when an Animal Spirit shows up in your life, the significance can still be somewhat open to your perspective and interpretation. In Steven Farmer's Animal Spirit Guides, there seem to be five somewhat different messages that may apply depending on your situation. That's pretty good advice "when the shift hits the fan" I think http://pixiedusthealing.blogspot.ca/2012/11/when-shift-hits-fan.html It might be interesting to note that in the Caribou clan, unlike reindeer actually, both males and females have antlers. There obviously (if you are a Caribou/Reindeer) are other ways to distinguish male and female! but it's not by looking at their heads. As the shift occurs and we embrace and become connected to the feminine aspect of being human, we might still need to pay attention to our masculine side as well. It isn't a competition, it's a balance to be obtained. http://pixiedusthealing.blogspot.ca/2012/03/energetic-tug-of-war.html And if you're going to make a decision, stay with it, and take action, I believe you might want to tap into your masculine side a bit. 2. 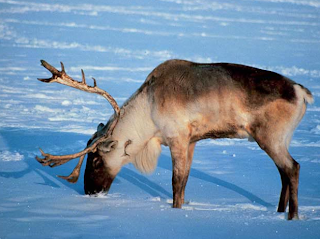 Farmer also writes the appearance of reindeer/caribou may indicate "something is bugging you, and you need to address whatever it is and either try and change, it, get away from it, or surrender to it. " Perhaps that's what you need to make the decision about. Seems like Reindeer energy is about not maintaining status quo, but about enabling change to happen. That means facing up to your negative side, or the negative things in your life so that shifts can occur. It's not about ignoring them, sugar coating them, or pretending they don't exist. It's about facing them and creating change. 4. According to Farmer, the Caribou may indicate "the long emotional and spiritual trek you've been on is about to conclude.". He goes on to write that "once it does you'll reap the rewards, benefits and pleasures of having done it. " More reinforcement to stick with your path and keep moving forward secure in the belief that the shift is for positive gain even if slightly uncomfortable along the way. 5. Finally, the message from Caribou Spirit may be, "although your journey may seem rather lengthy, as long as you seek the support you need, you will succeed." Caribou are herd animals. Santa has a team of reindeer and even though Rudolph may be shining up there in front, there is a whole team following behind her pulling that sleigh full of gifts. Rudolph doesn't "go it alone". Find your herd and don't be afraid to get other people to pull their weight too. If you need a little help pulling the Reindeer/Caribou signs into your life, the Bach remedy combination that could help might include Agrimony, Scleranthus, Cerato, Water Violet and Gentian. I'd recommend Agrimony so you could come out behind that mask you're putting up to pretend everything is okay. A few drops of Agrimony might help you face that "yucky" situation that really is bugging you when you're honest with yourself. Once you're facing the issue head on, a few drops of Scleranthus might help you pick a direction and go with it. If you have no idea how to proceed ,Wild Oat might be more helpful, but I have an idea "when the shift hits the fan", if you're honest, you'll see two directions. Pick one. Once you've picked the direction, Cerato can help you trust yourself, your decision, and your inner knowing in order to follow through and stick to the plan when those other reindeer from the other side of the river are trying to pull you over and across thin ice. Once you've made your decision, picked your direction and want to stick to it, you might find out you could use a few more members on your team. That sleigh can be pretty heavy even if it's full of great things. Water Violet can help you reach out to others, accepting help and reinforcement. Finally, the trek through the cosmos can get kind of dark by times even when you know you're heading towards the light. A few drops of Gentian might help restore your conviction that the reindeer really do bring the message that the journey is about to end with positive results. So.. if you think your hear the thunder of hooves behind you these days, consider that it just might be a team of Caribou disguised as Reindeer, or Reindeer disguised as Caribou - it doesn't really matter. They are likely pulling a whole sleigh of wonderful gifts right to you. Make way for the wonder. And, in the meantime, if you could use the Reindeer Remedy of Agrimony, Scleranthus, Cerato, Water Violet, and Gentian, go to my website www.pixiedusthealing.com It's had some shifting as well and has a new look. Send me a message and indicate you'd like a Reindeer Remedy and I'll send it ahead of the herd.